I've never been particularly big on goji's. Of course I was aware of their 'superfood' acclaim but I was always a bit 'meh about including them in my diet . However I've been superfooding it up much more of late, with the introduction of pretty much daily green smoothies, my course lectures at IIN and also the fact the the Real Food Source have added them to their shop gave me the obvious means to begin adding them more frequently in to my meals and snacks. They are high in antioxidants, specifically the carotenoids (like beta-carotene) and zeaxanthin (compound that absorbs blue light and helps protect the eyes). The antioxidants in the berries are thought to help fight off free radicals in the body. Goji Berries have about 20 different vitamins and minerals, making it one of the most nutritionally beneficial foods available. They have 18 different amino acids. They have been used for many years in teas, juices and tinctures to treat ailments naturally. My Wholeplus food range features 'Toppers' created as a natural sweet sprinkle topping for breakfasts, desserts and snacks of all sorts. 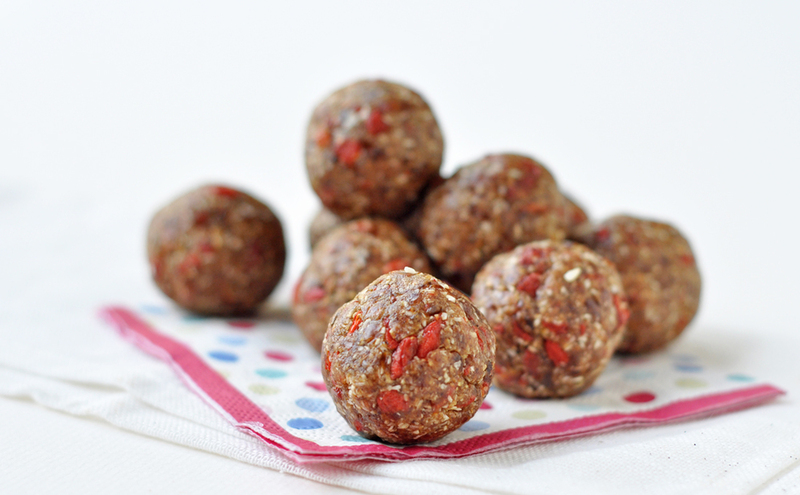 One of the flavours is Vanilla Goji Spice, and when blending up a big batch one day, I had the urge to smoosh some of the sprinkles together into a ball as a little afternoon treat, and voila... a gorgeous goji berry ball. I rolled in a few extra whole goji's for good measure. You could also roll in some extra coconut if you fancy too. Grind dates with spices and half coconut until sticky and coarse. Add remaining coconut and gojis and pulse until coasre and chunky. The mixture should still be sticky enough to roll into balls (stickiness will depend onto moisture content of the dates to start with). 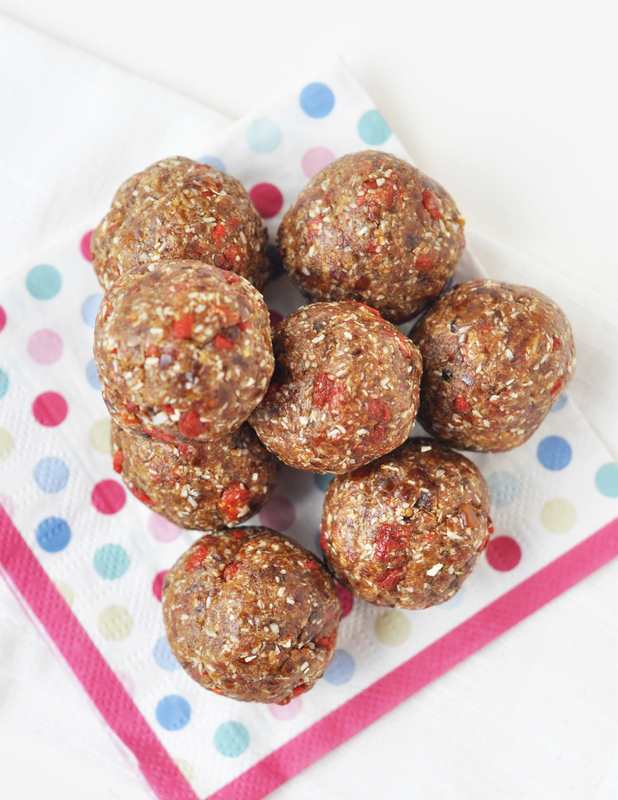 Roll the balls in extra coconut or gojis if desired.